ST. LOUIS, May 10, 2018 /PRNewswire/ -- The dog (and cat) days of summer just got a lot cooler for local beer lovers and area shelter pets, thanks to Purina and Urban Chestnut Brewing Company (UCBC). The two pet-loving companies are teaming up to promote summer pet adoptions through the sale of Urban Underdog American Lager. 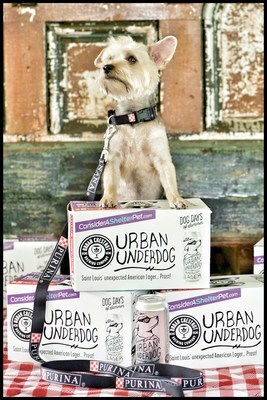 For every specially marked summer eight-pack of Urban Underdog sold to area retailers through the end of July, Purina will donate $5 to the Petfinder Foundation. The donations will help offset pet-adoption fees between June 1 and August 31, 2018 at participating area shelters and rescues. The specially marked summer eight-packs of Urban Underdog feature the Urban Underdog character, along with sidekick pet hero, Undercat. The eight-packs are sold at grocery stores and beer retailers in St. Louis city, St. Louis and St. Charles counties and the Metro East area. During the #ConsiderAShelterPet Summer campaign, Purina will donate up to $100,000, including $5 for each specially marked Urban Underdog eight-pack, to the Petfinder Foundation to provide $25 subsidies toward individual pet-adoption fees from June 1-August 31, 2018 at participating area pet shelters and rescues. In addition to receiving the $25 adoption subsidy, anyone who adopts a pet from a participating organization during this period will receive a certificate that is redeemable at the Urban Chestnut Grove Brewery & Bierhall for a special UCBC swag pack while supplies last. "Our partnership with Urban Chestnut is based on our mutual passion for pets, and our shared desire to bring people and pets together," said Libby Davidson from the Purina Pet Welfare Team. "By working together through Purina's #ConsiderAShelterPet Summer program, we can give pet lovers and beer lovers alike a simple way to help local adoptable pets find forever homes." To bring people and pets together throughout the summer, Urban Chestnut and Purina will host a series Dog Day Friday events to offer pooch-friendly fun on the east lawn of the Urban Chestnut Grove Brewery & Bierhall at 4465 Manchester Ave. in St. Louis. On select Fridays from 4:30 p.m. until dusk, the public is invited to these pet-friendly events featuring cold beer, hot food, games, live music and pet-adoption activities. Twenty percent of beer and food sales from Dog Day Fridays will benefit featured animal organizations. "As someone who has two rescue dogs and co-owns pet-friendly breweries, I consider this partnership to be a no-brainer," said David Wolfe co-owner and co-founder of Urban Chestnut Brewing Company. "Working with Purina to find homes for more shelter pets is a win for the pets, their owners and our community – and we are proud to do our part." The summer program is an extension of Purina's annual #ConsiderAShelterPet campaign, which urges residents of the St. Louis area to get to know shelter pets as they really are – happy, healthy, lifelong companions looking for loving homes. This is the second consecutive year that Purina and Urban Chestnut have teamed up for a philanthropic effort. When the two companies first worked together in 2017, they helped provide nearly $50,000 in adoption-fee subsidies to area shelters and rescues. For more information about Purina's #ConsiderAShelterPet Summer campaign, Urban Chestnut Dog Day Friday events, a list of participating shelters, or help finding adoptable pets in your area, visit www.considerashelterpet.com. Urban Chestnut Brewing Company (UCBC) is an unconventional-minded yet tradition-oriented brewer of craft beer. Founded in 2010 by ~ Florian Kuplent- a German born and trained brewmaster with extensive experience at both small breweries, worldwide, and with the world's largest, Anheuser-Busch, AND David Wolfe - a 20-year brewing industry member ~ Urban Chestnut operates three breweries in St. Louis, Brewery & Biergarten at 3229 Washington Avenue in Midtown St. Louis, Grove Brewery & Bierhall at 4465 Manchester in Forest Park Southeast St. Louis, and The U.R.B. (Urban Research Brewery) at 4501 Manchester also in Forest Park Southeast St. Louis, where they brew batches of artisanal, modern American beers (their Revolution series) and classically-crafted European styles (their Reverence series). Urban Chestnut also operates a fourth brewery, Urban Chestnut Hallertauer Brauerei, in the Hallertau region of Bavaria, where they brew their Hallertauer Serie; small batches of locally sourced, Bavarian bier.